Oral history interview with Daniel Ezekiel who was born in Manila. His family is split between Ashkenazi and Sephardic. 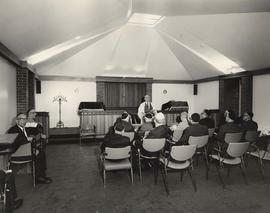 Photograph depicts a group of men seated in the synagogue with one man, presumably a rabbi, in front. Photograph depicts the exterior of Beth Tikvah synagogue. Photograph depicts several adolescents performing in matching t-shirts. Photograph depicts the choir behind an unidentified string quartet. Photograph depicts a group of young women from the Beth Tikvah Youth Group posing for the camera. Brenley Charkow is possibly featured. 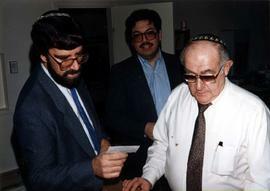 Photograph depicts Jerry Adler (left) and Ted Zacks (right) in conversation, with Father Michael A. Daniel and an unidentified women in the background.